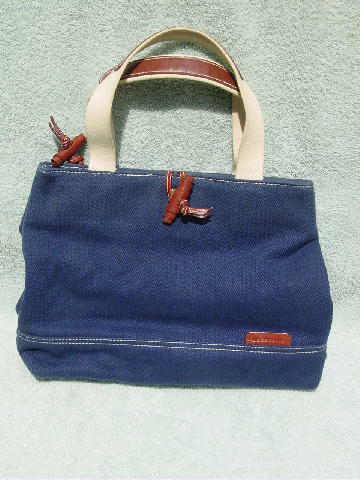 This vintage 100% cotton dark blue ribbed tote is by Liz Claiborne. It has 3 separate sections. The front and back interior have a white and vertical blue stripe fabric lining and snap closure. 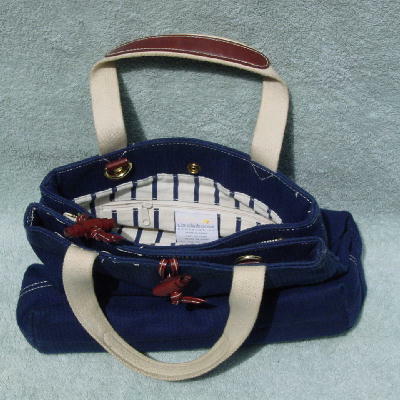 The center section has the blue fabric lining and a top zippered closure. It has a rolled leather zipper pull and a matching decorative rolled leather ornament in the front. The back section has a interior zippered pocket. It has 2 dark brown fabric 15 1/2" long handles with leather top accent strips. The front has decorative white stitching.